AGE ISN’T JUST A NUMBER—IT’S A WAY OF KEEPING SCORE. The day we turn any age, we become contemporaries of everyone who has ever been that age, and it becomes our business to know that Bob Dylan wrote “Blowin’ in the Wind” when he was twenty, Orson Welles cowrote, directed, and starred in Citizen Kane when he was twenty-five, Winston Churchill was fired from the Admiralty when he was forty and took up painting, and Jane Austen died, unmarried and mostly unknown, when she was forty-one. Knowing who did what when provides the yardstick by which to measure our own progress; it’s comforting to learn that Grandma Moses didn’t show her first painting until she was seventy-eight, and discouraging (but not surprising) to discover that Einstein was already smarter than you at age sixteen. A witty, ironic collection of moments from famous lives organized by year of age from infancy to death, A Book of Ages tells you who is doing what, who is on top of the world, who is waiting for his luck to change, who is saying unkind things about whom, who is planning his revenge, who is meeting for the first time, and who Elizabeth Taylor is currently divorcing. 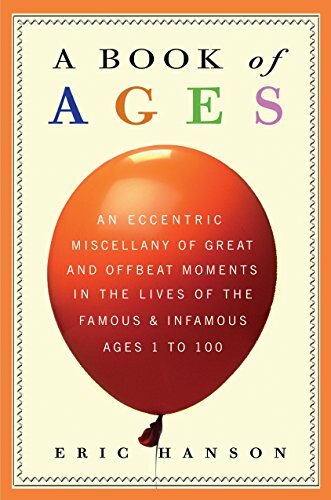 An Eccentric Miscellany of Achievements,Misdeeds, Crossed Paths, Bypaths, Inventions, Scandals, Child Prodigies, Late Masterpieces, Marriages and Breakups, Feuds, Dead Ends, Second Chances, Adventures and Misadventures, Novels Written and Battles Won and Lost, All Organized by Year of Age. View More In Reference & Collections. If you have any questions about this product by Three Rivers Press, contact us by completing and submitting the form below. If you are looking for a specif part number, please include it with your message. The Zincali; or, an Account of the Gypsies of Spain. With an Original Collection of Their Songs and Poetry, and a Copious Dictionary of Their Language.